Some people might think that being a landlord is a great way enjoy a passive income stream, where once you’ve outlaid some capital to fund part or all of a property, you can just sit back and take the money. 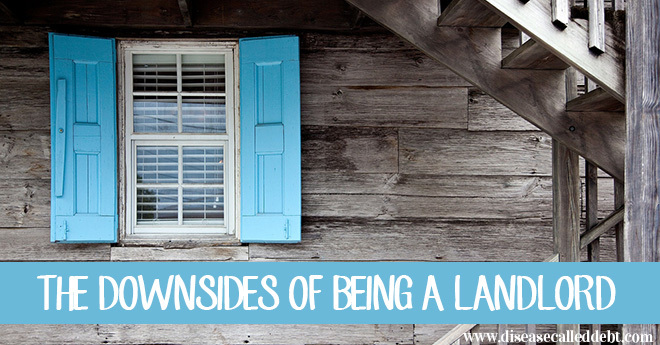 In reality, unless you’re a property mogul with a string of properties under your belt and a team of people who do the dirty work for you (believe me, it can be very dirty), being a landlord can be a right royal pain in the backside. Not to mention a drain on your pocket. My husband and are currently renting out our former home and have done so for the last few years. We relocated to be closer to my husband’s work and because at the time our house wasn’t worth much, we couldn’t sell it, hence the reason for renting it out. Now, it’s increased in value a little, but we’re still struggling to get the sale that we desperately want! In this post, I’ll outline some of the reasons why we can’t wait to see the back of our time as landlords – and why, if you’re thinking about becoming a landlord, you should seriously consider whether it’s worth the hassle. Everytime I see my tenant’s name flash up on my mobile phone screen, my stomach sinks and I answer the call with dread. Usually, when a tenant rings you, there’s a problem. Unless you know your tenant very well, they’re probably not going to be phoning you for a friendly chat. The amount of times your phone will ring depends on two things. How many problems your property actually has and how “needy” your tenant is. My last tenants were of the particularly needy variety. I had phone calls about door handles coming loose, cupboard doors sticking, who they could use to trim the hedge and other little things that they could have sorted out themselves. As much as you might get a happy tenant who loves your property, there is a chance that they aren’t going to treat it like their own. They’re not always going to take their shoes off when they enter the house and because the house isn’t their own home, they’re probably not going to spend too much money on it. I can vouch for this from a tenant’s perspective because I haven’t spent much money at all on the house we’re living in. I do like the house but I’m not going to throw money away when I need to save up for a deposit to buy a house of my own. I imagine lots of tenants could feel the same way. From the landlord’s view though, there’s nothing worse than going into a rental property and realising how much work needs to be done. Because rental time does equal wear and tear. Over time, money will need to be spent on general maintenance jobs. This is the best case scenario. If you get a tenant that really doesn’t give a crap about your property, you could see your house trashed and a lot of financial consequences as well. In addition, not everyone will have the same standards of cleanliness as you’d like. Our last tenants were “surface cleaners”. The house looked clean and tidy upon inspection, however after they’d left we noticed mould around the window seals, blinds filled with dust and marks on the paintwork. Even if you don’t have a mortgage on your rental property, there are regular costs to take into account during the course of the year that will eat into your profit. You’ll need to pay for landlord insurance to protect yourself in case your property is ruined through fire, water or vandalism. If you’re renting out a property through an agent, there will be management fees to pay which could add up to around 10% of your monthly rental income. Then there are annual gas and electrical inspections to pay for each year. If you do have a mortgage on the rental property then you may also have to pay an annual fee just for the pleasure of renting it out. There’s also the dreaded tax bill. Depending on your earnings, you may have to pay tax on your profits, less any expenses. As well as general maintainance costs and regular expenses, there will be times when something awful happens like if the heating breaks down or there’s a water leak. Those times usually mean big bills. We’ve been lucky so far, we’ve only had one really bad problem which no-one could have foreseen. A pigeon got stuck down the chimney and the gas fire had to be disconnected and removed in order to get it out. Otherwise the poor bird would have no doubt died and rotted in there! I’m referring to my experience in the UK here – basically the landlord doesn’t really have many rights when it comes to evicting tenants. There is a court process that needs to be followed and that can take up to two months and of course, it will cost money. For example, if a tenant doesn’t pay rent and they are in breach of contract but they won’t leave, the landlord can apply for a possession order and then to bailiffs to remove them from the property. But all this takes time and if no rent is being paid during this period along with court fees on top, this situation could turn into a financial disaster for a landlord. Imagine if such tenants decided to trash the place before leaving too? Doesn’t bear thinking about does it? Sadly, this does happen and all too often. If you’re thinking about becoming a landlord, you should make sure you know the law around tenancies before going ahead with any agreement. We didn’t really think about this until after we’d rented our house out and so far we’ve been lucky that we haven’t had to evict a tenant. In hindsight, it’s much better to learn about your obligations for becoming a landlord well in advance of actually doing so. In the UK for example, there are certain rules that you must abide by when renting out a property. These include making sure your tenant’s deposit is protected in a government-backed tenant deposit protection scheme and you must give your tenant plenty of notice if you intend to access the property. My brother inherited my parents’ house free and clear. He has to pay insurance and taxes on it monthy, and of course the maintenance costs. He is considering bulldozing it because renting isn’t paying much. I can’t say I’ve had a lot of luck with residential property… Not exactly horror stories but definitely disappointing. It’s not something I’d venture into again. But, I know people who’ve not only done well but never had any real problems with tenants. The difference? They’ve managed the property themselves. I think that’s the key. If you don’t have the time or inclination to manage the property yourself (including finding tenants), there are probably less stressful ways of investing your hard earned cash. It’s great to see someone discuss the less glamorous side of property investment! No matter how well you screen tenants yourself, hoping to avoid a problem tenant, it’s impossible. Bite the bullet and pay someone to manage the property for you. They find and evict tenants, answer the late night phone calls, and deal with the headaches. For a fee, of course. Then the problem becomes finding a good manager. But it’s much easier to find a reputable manager than it is to find a good tenant. I’ve been a landlord but for a rooming house. It was exhausting to be sure. I was glad to be rid of the house. When we save enough for a rental property, we’ll be getting a property manager — even if that means taking a loss for a bit. There’s just no way I can deal with the tenant’s calls directly. We’ll still get the dreaded “something needs fixing” call, but at least it’ll be from a professional. I think being a landlord is still advantageous, despite these downsides, which are avoidable and become easy to handle with the help of other people and having good tenants. What I like about being a landlord is that income, which is undoubtedly the main reason I consider becoming a landlord. 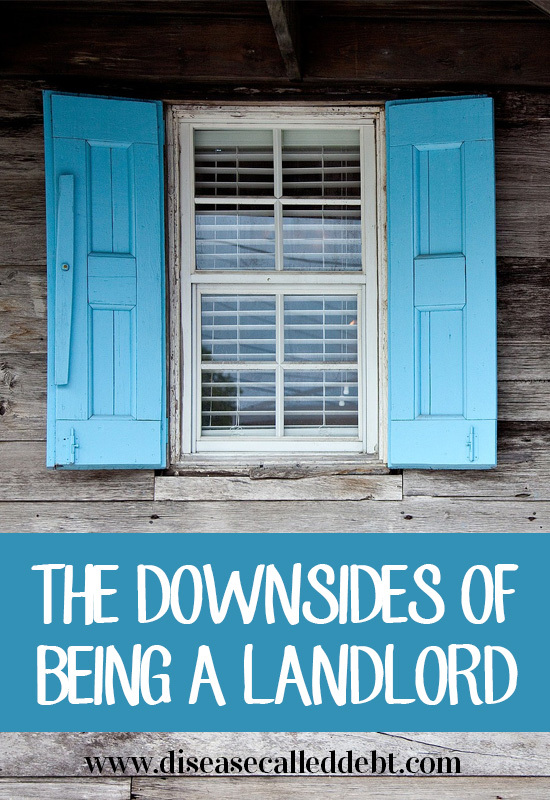 It’s almost scary to become a landlord! Your post gives a great outline about all the downsides and makes me think before we make that decision. I’ve thought about being a landlord for a while in a college town, but until I actually settle down somewhere that allows me to take care of the property, that plan is on hold. I am a tenant! I have to admit to being a bit of a ‘surface cleaner’ too – or as we call it in our household – a superficial tidier!!!!! I would advise anyone considering this to reconsider. Being a landlord is by far, the most stressful annoying, frustrating job I’ve had. I have one house I rent. I have a solid lease. After moving in with my now husband, we couldn’t sell the house I had bought without losing, so I figured that renting would be no big deal. It’s a nice little duplex and was taken care of and had a few nice upgrades. Take the rent, pay the mortgage and have a little left over. First tenants looked great on paper. Very nice couple. Paid rent for two months and then disappeared. No notice. went to the house and luckily it was clean and nothing damaged. this left me with out tenants for 2 months as installed new electric baseboard heaters and did some painting and floor work. Most people don’t usually move in Oct-Dec either. 2 months, 2 mortgages. Financially horrible. Next tenants moved in January. Paid rent, not dirty people but very annoying. Everything that may be broken or show any signs of not working right, they called. Simple things, like a broken $10 toilet seat.Right after my double carpal tunnel surgery I spent my recovery days searching for an affordable fridge to replace the other one. Compressor blew up. Not their fault, but I had to shell out $400 and lose rest when I should have been recovering from surgery. They left on amicable terms and after 6 months needed to find tenants again. I’m on my 3rd set of tenants. I have started the eviction process. They paid extra on their security for 2 cats and 2 dogs. Previous tenants had a dog and cat and no issues at all btw. They are horrible. 18 cats. 40-70 bearded dragons and all in dozens of brightly lit cages all through the house. parakeets, dozens of young quail, chickens, other birds and 3 dogs. I did a home inspection because a cop called me one night telling me that the noise complaints from them screaming all night is getting old. I could write a book about all the things that are wrong with these “people”. Here’s the reality. My house is destroyed. I even checked landlord references and drove by their current house before lease signing. “I had no idea and I will be broken financially and am broken mentally now. At this point short selling is looking like a good idea. Property management was way too expensive as I checked into it. This was a terrible idea because I don’t live nearby, don’t have much free time because I work FT, and the cost is immeasurable in terms of mental health. I don’t recommend for anyone unless they have more capital upfront and have time to manage property. It is a headache like nothing I’ve ever dealt with. Oh wow, I thought I’d had bad luck with tenants but seriously… 18 cats and 40-70 bearded dragons? That takes bad tenants to a whole new level! I’m so sorry to hear about the nightmare that you’re going through. I totally feel for you because from my own experience, I feel emotionally scarred from it and that’s nothing compared to what you’re having to deal with right now. My advice is to take whatever offer you can get for the place and walk away from it. The mental cost is just not worth it. I might be having to do the same with my house too. Here’s to never being landlords again, right?